If you are wondering how to make oatmeal in the microwave, this is for you! Microwave oatmeal is ready in under two minutes and not only is it nutritious, oatmeal can also aide in weight loss. I’ve got all of the tips you need to make the perfect bowl of oatmeal in the microwave. Oatmeal has always been a staple in my house whether it’s a bowl of hearty steel cut oats or oatmeal cooked on the stove top. 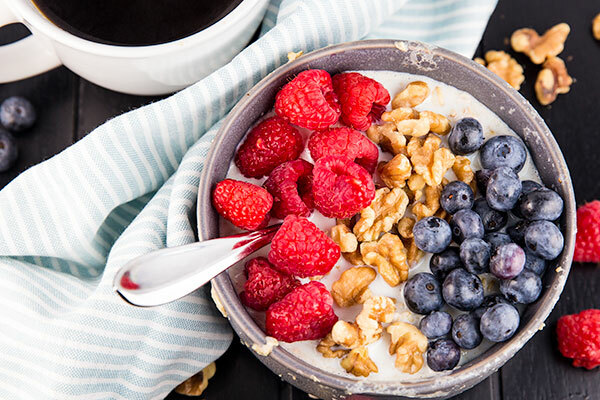 The great thing about oatmeal is that you can add any mix-ins you’d like to really create the most perfect oatmeal for your taste buds. One of the most viewed recipes here on CenterCutCook is my recipe for How to Make Oatmeal. It’s a great, basic recipe that explains how to make oatmeal on the stovetop. While I do like oatmeal made on the stove, if I’m being honest, I make oatmeal in the microwave far more often because it’s so quick! I’m talking under two minutes to perfect, warm oatmeal every single time. Today I thought I’d share with you how I make oatmeal in the microwave. But first, let’s talk about…. There are so many benefits to making oatmeal at home. Oats are super nutritious and rich in antioxidants. Not only are they healthy, they’re also super filling. While I tend to buy my fair share of Quaker oats, I’m also a huge fan of Bob’s Redmill Oatmeal which you can find in most grocery stores or on Amazon. 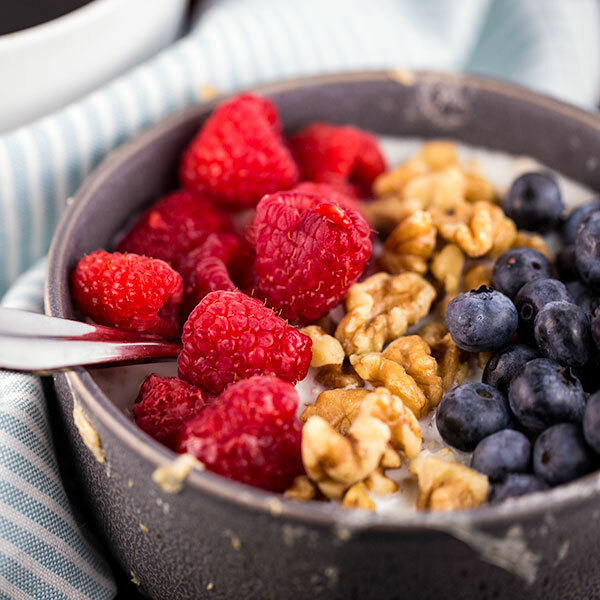 While simply eating oatmeal isn’t going to help you drop weight, it is tied to weightless because Oatmeal helps you feel full longer. And if you feel full, you’re less likely to snack. Just be sure to be mindful of the portion that you eat because that makes a difference too. Oatmeal is so versatile. You can add any ingredients that you’d like. 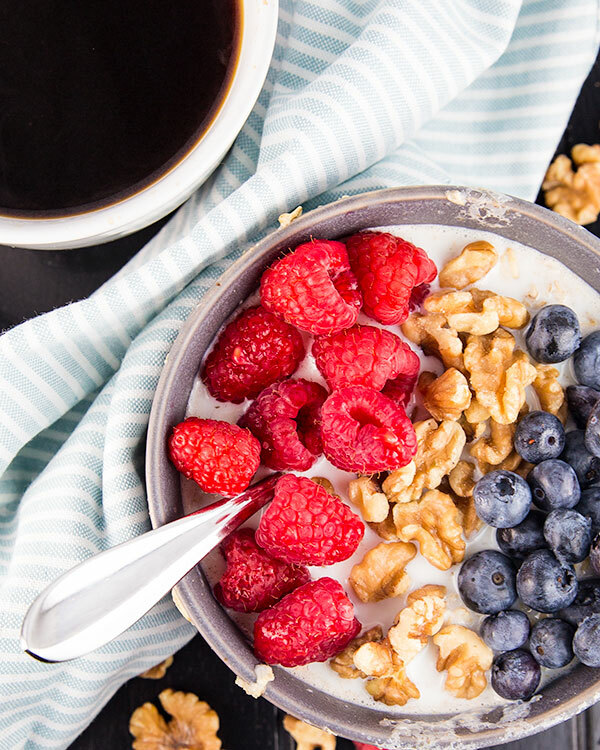 I love to top my oatmeal with fresh berries, cinnamon and chia seeds, but you could top it with anything that you’d like. Bananas are delicious, even apples or peaches! Be sure to add a pinch of salt too. That really helps with the flavor as well. If you’d like to have a bit of sweetness to your oatmeal, real maple syrup is a great option. I grew up putting brown sugar on my oatmeal, but these days I prefer maple syrup. *Tip: I have found that Costco has the best deal on real maple syrup. You get far more syrup for far less than what you’d pay at a typical grocery store. *Tip #2: I love adding a little bit of vanilla extract to my oatmeal. It adds another layer of flavor that’s so comforting and delicious! *Tip #3: Make oatmeal with milk instead of water. While you can use water, I have found that oatmeal tastes creamier and more delicious with milk. You can use any milk that you’d like including cow’s milk, almond milk, cashew milk, etc. When you make oatmeal, make sure to use a deep, microwave safe bowl. What do you like to put on your oatmeal? If you have an Instant Pot, take a look at my recipe for Instant Pot Maple Banana Bread Oatmeal. It is SO DELICIOUS and so satisfying. Another delicious option is my recipe for Baked Peanut Butter Oatmeal. Make it a great morning. Enjoy! 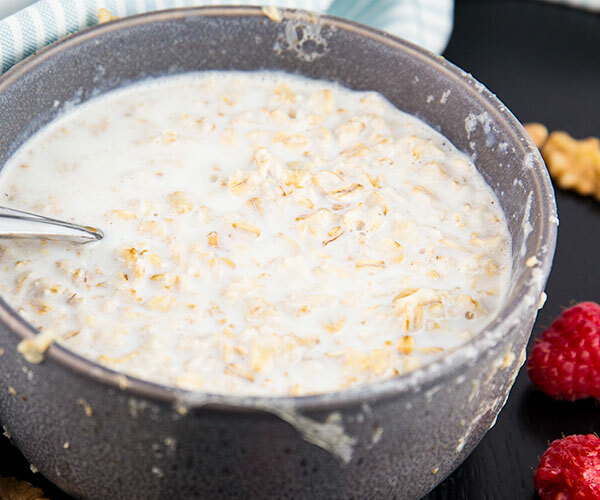 Combine milk (or water) with oats, salt, vanilla extract and butter in a deep microwave safe bowl. Microwave for 90 seconds – 2 1/2 minutes, or until the oatmeal is cooked to your desired tenderness.